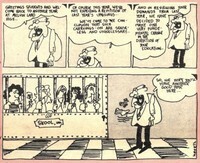 This cartoon features a teacher speaking to his classroom and welcoming them back. He tells them that they have made a few small changes after the uprisings of the year before. 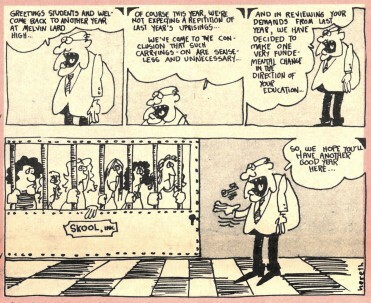 In the final panel the view expands and the students are locked up in a cell. “Ann Arbor Sun Political Cartoon - Education,” Student Digital Gallery, accessed April 24, 2019, https://digitalgallery.bgsu.edu/student/items/show/8267. The 1960s and Youth Culture exhibit is part of the Student Digital Gallery at BGSU.